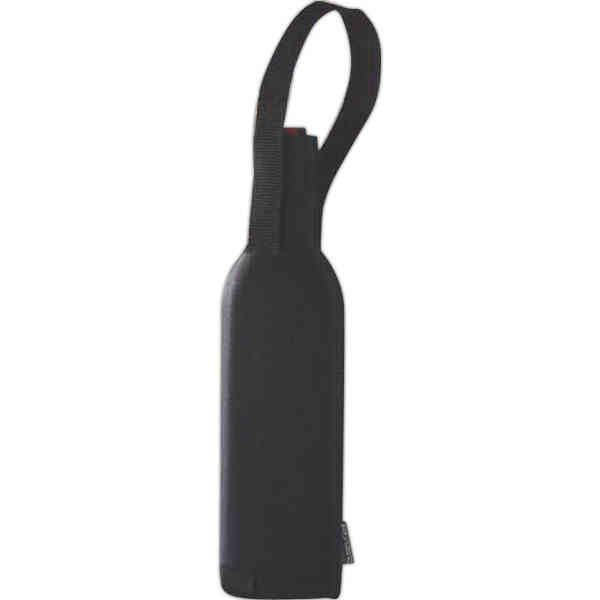 Have heads whipping around in your direction with ease when you advertise with this sling-handle neoprene wine bag! It measures 12" H x 5 1/8" W and is made of neoprene material. This unique bottle carrier can fold flat and the handle stands 6 1/8" above the bottle. The circular sling handle is pulled downward at the base when a bottle is pushed into the bottom opening upward into the stretchable sleeve. The sling handle holds the bottle in securely. Customize it with your branding information for the ideal advertising look! Size: 12 " x 5 1/8 "